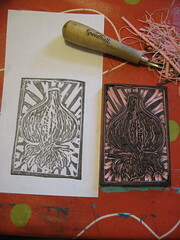 hand carved lino-cut stamp by stephanie tichenor. 2008.
super tomato! thats what i think when i look at this print that i made today. but james said it looks like a communist propaganda poster. that made me laugh a lot. garlic. stamp+print. w. carving tool. hand carved lino-cut stamp by stephanie tichenor. whats up with steph? making stuff as usual. 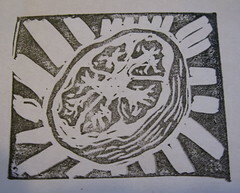 today i made this stamp and a few prints from it. today i also made: a loaf of bread, tomato stamp, lots of prints, homemade onion rings (as part of a balanced dinner of lemon-pepper tofu, with salad of sprouts, pea greens, and beets. ) and i printed some tomatoes on fabric too. fun. 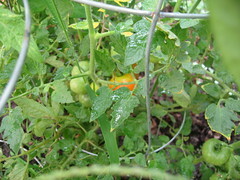 first color on the tomatoes! do you see it? i am getting excited! i better learn how to can -and quick. 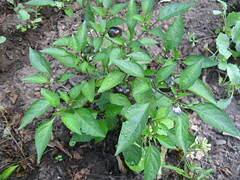 purple pepper update: they are really really really freakin’ hot! 🙂 i was on the phone, james was at home, he said he was gonna try one of the purple peppers and that he just couldnt wait any longer. 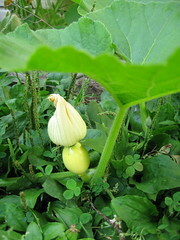 we wondered when to pick them: they are already purple, but so small, we didnt know if they would get bigger or what, so we were trying to wait a little while. james picked a purple pepper and chomped a bite, they are really small, it was enough for him to scream into the phone, “its hot, its hotttt, its really freakin’ hot!” after some cold soy milk, then some dairy ice cream james felt a little bit better. we think he maybe ate the seeds too, and they are hotter than the pepper itself. it was labeled as “black pearl” but we havent found that much info on them. the ones that we found that look similiar are hot too. so maybe i will make some olio picante??? ?